When I think of autumn, potato soup is the first meal I crave- hot, comforting, and a little spicy…YUM! I know autumn isn’t here yet, but we’ve had several unseasonably cool days which have found me cooking favorite warm, comfort foods. 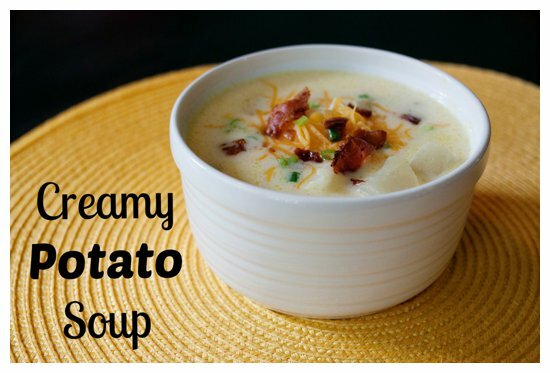 I grew up eating this yummy, creamy potato soup and now it is a favorite of my family also. It is the perfect meal for a cool, fall evening. Customize the soup by adding more or less spice, and by choosing how you serve it. My mom simply served the soup with a plate of peanut butter crackers to dip into the liquid. I love crumbling a hot cornbread muffin into my potato soup while my husband prefers it served with extra cheese, bacon, and green onion sprinkled on top. Pour the chicken broth in a large pot. Whisk the flour and pepper into the chicken broth. *Adjust the amount of white pepper according to how much kick you like. 1 teaspoon will give a nice flavor, while 2 will be a little spicy. If you like really spicy add 1/2 teaspoon cayenne pepper also! Add a stick of butter to the liquid in the pot. Stir the peeled and chopped potatoes into the pot and turn the heat to medium high. The liquid should begin bubbling mildly as the potatoes cook. Cook for 30 minutes or until the potatoes are done. Stir in the cheddar cheese until melted, and then stir in the half n half. This sounds so delicious! I bet my whole family would LOVE it!